The Benjamin Bowring, which formed the sea base for Transglobe during the three-year expedition, was in fact a pioneer in her own right. She was the first designed and commissioned by her original owners to operate in Arctic and Antarctic conditions. She was conceived when a director of the Danish shipowning firm J. Lauritzen A/S heard that lead-mining was being developed in north-east Greenland at Mestersvig and it was decided that the firm should acquire a modern steel ship for the trade. Designed in conjunction with the builders, Aalborg Vaerft A/S, the all-welded 1,250 tons deadweight Kista Dan (as she was then named) was first commissioned in 1952. So well suited was she to polar conditions that from the outset she was used in both the Arctic and Antarctic. She would spend the northern summer months plying between north-west European ports and the difficult north-eastern coast of Greenland, and then would sail south for each Antarctic summer season. Her first Antarctic charter was to help make the film “Hell below zero (based on the novel “The White South” by Hammond Innes). From then on until 1965/6 she was chartered first to the Australian Antarctic Research Expedition, and then for several seasons to the British Antarctic Survey. After that she was sold to Karlsen Shipping, renamed the Martin Karlsen and used in survey work by the Bedford Institute of Oceanography based at Halifax in Nova Scotia. The organisers of Transglobe had known almost from the outset that it would be impossible to mount the Expedition without a suitable ship, and they had searched energetically for both a ship and a sponsor. 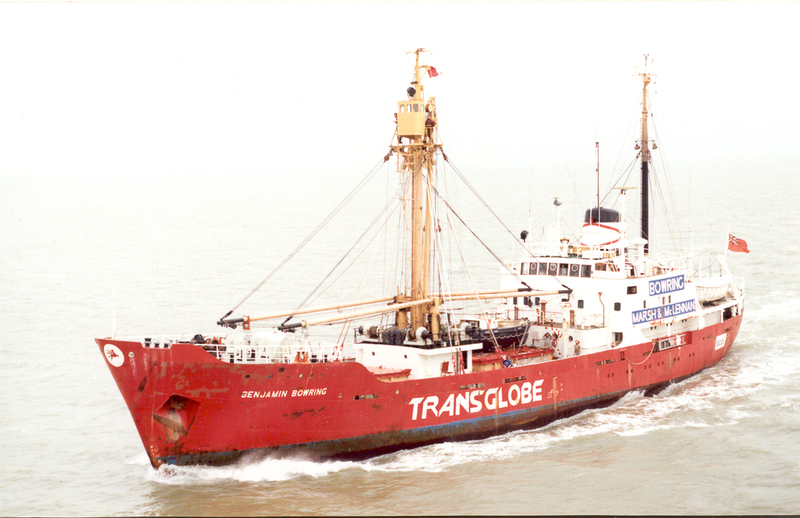 Because the Kista Dan had been used by the British Antarctic Survey, and because the Director of the Survey, Sir Vivian Fuchs, is Chairman of the Scientific Committee of Transglobe, the vessel was naturally identified. The sponsor was more difficult. Anton Bowring, Transglobe’s Marine Coordinator explored the possibility of funding from the insurance broking and shipping company established, by his ancestors, which had owned notable polar vessels in the past. The most famous of which had been the ‘Aurora’ and Captain Scott’s ‘Terra Nova’ which supported his ill fated South Pole expedition in 1911. However, the Board of CT Bowring & Co Ltd felt at that time that the very considerable expenditure involved would be hard to justify to their shareholders. Then in September 1978, Bowring came to an agreement with the American insurance broking firm of Marsh & McLennan Companies, Inc., to develop the co-ordination of their insurance interests. By the time Transglobe held their inaugural conference at Farnborough in February 1979, Marsh & McLennan and Bowring had together agreed to share the acquisition of the vessel, thus not only making a joint contribution to the advancement of commerce, science and exploration, but also visibly confirming their plans for co-operation. Both companies agreed that because of Bowring’s long-standing ship-owning experience, the vessel would be named Benjamin Bowring after the firm’s founder, and would sail under the Bowring house flag. The Benjamin Bowring is approximately 213 ft. (65 m) in length overall, 36 ft. 9 in. (11.2 m) in moulded depth. Her mean draft fully loaded is 19 ft. 9 in. (6 m) but she is built with a 5 ft. (1.5 m) trim aft, so that at normal trim her maximum draft aft is 22 ft. 3 in. (6.8 m). Her engines are by Burmeister & Wain, the main engine being a single acting two-stroke 6-cylinder diesel with a regular output of 1,560 IHP, giving a fully-laden service speed of 12 knots. Special ice strengthening in her bows and frame includes a 75%-100% increase in shell plating thickness compared to conventional vessels. There is one-inch thick plating round the bow, and frame spacing of only twelve inches along the full length of the ship. This multiplies the local shell strength by 16 times the requirements of the Classification Society. The propellor is protected from ice by special ice fins and an ice-knife guards the rudder and rudderstock from damage when going astern in ice-filled waters. The stem is properly designed to assist the vessel in riding onto and breaking up the pack ice. An interesting feature is that her bridge controls are duplicated in a conning tower on the foremast to facilitate navigation in ice. The boat deck is specially strengthened to support a helicopter landing deck. She has a hold capacity of 52,000 cubic ft. (1,472 cubic m) and there is 2,200 cubic ft. (62 cubic m) of refrigerated space on the tween deck. She has one 20-ton derrick and four of 3½ tons capacity each. There is accommodation for 49 passengers and crew, including a 2-berth sick bay. The accommodation is insulated to retain warmth in cold climates. The Transglobe Expedition made further improvements by fitting out the vessel with the most up-to-date electronic equipment, thus combining a well-proven hull with the requirements of a modern vessel. A Lloyd’s Register Special Survey was completed prior to the start of the Expedition. In 1984 she was sold to Freighters & Tankers Ltd, Hamilton, and renamed Olimpiakos. She was sailed to the Greek island of Kos and part converted to a yacht by John Goulandris (Greek shipowner) and became permanently laid-up.